Oscar Wilde - The Nightingale and the Rose; The Happy Prince; The Selfish Giant; The Devoted Friend. Roald Dahl - Galloping Foxley; Lamb to Slaughter; The Way Up To Heaven; Mrs Bixby and the Colonel’s Coat. O.Henry - The Gift of the Magi; The Last leaf; The Ransom of Read Chief; The Cop and the Anthem. They were asked to reflect on the stories after reading and then write down their thoughts. 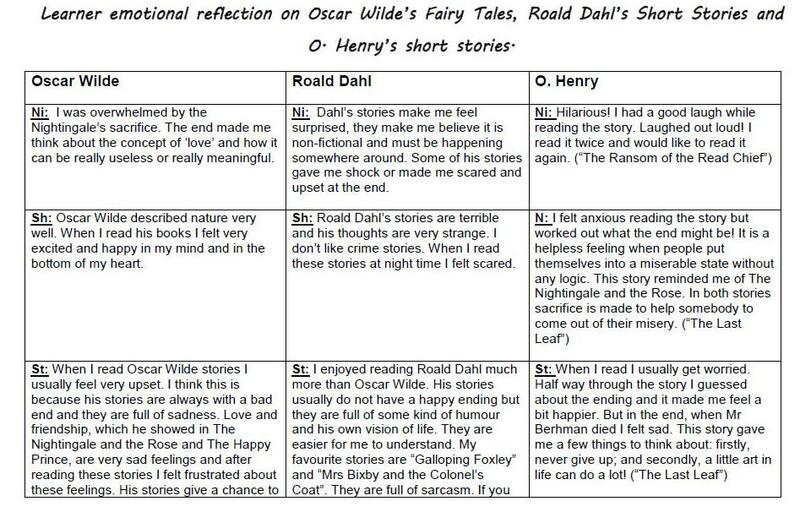 I have collated some quotations from their reflections and organised them by author to facilitate a comparison. When choosing the quotations I looked for adjectives that describe emotions. In my opinion these quotations best illustrate the learners’ emotional involvement in the process of reading the literature. If you would like to read what four of the learners wrote about their reflections on these stories in full, please click here. When learners reflected on the stories, they showed a great amount of emotional involvement in the process of reading. This confirms Collie and Slater (1997) opinion that, in the process of reading, the focus of their attention shifts "beyond the more mechanical aspects of the foreign language system". When reading Oscar Wilde’s Fairy Tales for the Book Club, one of the Level 1 students discovered there was an exhibition going on in Reading about Oscar Wilde and Reading Gaol. She suggested going on a trip. In October 2014 Entry 3 and Level 1 classes went on an Oscar Wilde walk in Reading. We saw the prison where he spent two years of his life, walked along the canal and read extracts of his Ballad of Reading Gaol. After that we walked to the Berkshire Records Office to see an exhibition about Oscar Wilde and Reading Gaol. After the trip several learners learned an extract of The Ballad of Reading Gaol by heart and recited it in class. This was a great achievement of the Book Club project as it was entirely the learners’ initiative to go and see the prison and the exhibition. Read the WEA Newsletter about the trip.